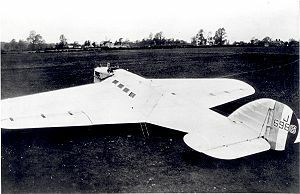 The Westland Dreadnought was an experimental single-engined fixed-wing monoplane design for a mail plane created to trial the aerodynamic wing and fuselage design ideas of Woyevodsky. It was designed and built by British aircraft manufacturer Westland Aircraft for the Air Ministry. Only a single aircraft was ever built, and it crashed on its initial flight, badly injuring the test pilot. The Dreadnought was distinct for its futuristic design and method of construction, based on the theories of the Russian inventor M. Woyevodsky. After preliminary tests of the idea were tried and met with some degree of success, the design was given to Westland Aircraft for the Dreadnought. The design was aerodynamically advanced, featuring a continuous aerofoil section over all parts of the aircraft, including the fuselage and, unusually for British aircraft at that time, had no form of wing bracing. Construction was all-metal, comprising drawn channeling with a corrugated sheet skin. The method may be compared to the modern stressed skin construction. Another advanced feature was the fail-safe ejection system. Although conceived as a twin-engined type with retractable undercarriage, the design that emerged was fitted with a single 450 horsepower Naper Lion II 12 cylinder engine that allowed the Dreadnought speeds of up to 102 miles per hour. and fixed undercarriage. On completion of the Dreadnought, pilot Stuart Keep carried out taxi trials and short airborne hops. On 9 May 1923 or 1924, he took off for its first flight test. While the aircraft was initially stable, it soon became clear that Keep was losing control, and not long after, at a height of approximately one hundred feet, the Dreadnought stalled and crashed. Keep sustained severe injuries, and later had both legs amputated. After this failure, the Dreadnought design was abandoned, although the ideas that were conceived and used in its making were visibly an advancement in aircraft and are appreciated as such in the present day. Junkers - earlier pioneer of several all-metal monoplane types with corrugated skin. McDonnell XP-67 Bat - a later design with all-aerofoil profiles. Flight International. IPC Transport Press Ltd., 1960. p. 43. James, Derek N. Westland Aircraft since 1915. London: Putnam, 1991. ISBN 0-85177-847-X. Lukins, A.H. The Book of Westland Aircraft. Leicester, UK: Harborough, 1944. Mondey, David. Westland: 2 Westland. Lonodn: Jane's, 1982. p. 17. Westland Dreadnought Pictures and Westland Dreadnought for Sale.